Getacademichelp.com Reviews 2019 | Is Getacademichelp.com Reliable, Legit and Safe? If you are a student, the chances are that you will likely encounter some assignment that seems too challenging to deal with on your own. It is good to be prepared in the event of such an eventuality. You need to be able to identify a competent service from which to order a paper fast and safe. 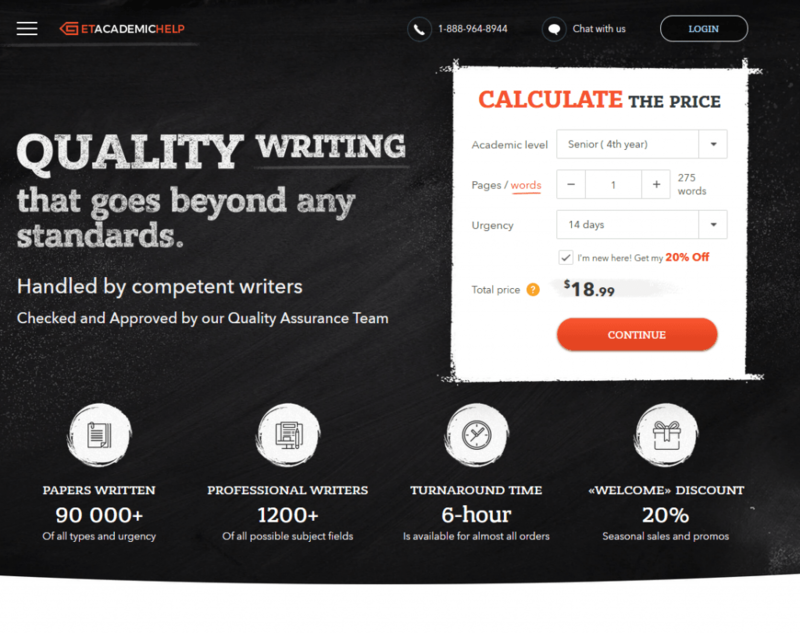 In our bid to identify a service where one can get fast writing assistance, we decided to engage getacademichelp.com after reading some testimonials they had posted online. Given their assertion that the company had existed for more than five years in the writing service industry, we expected a sound business model as well as a solid reputation for consistent delivery. Based on our experience with the service, we conducted this review as we do all others, by examining the website content, on-site testimonials, and any blog posts of samples on the website. We also researched any reviews of the site available online relating to their service, pricing, bonuses, and discounts. Lastly, we placed an order for a research paper, which we evaluated for originality and quality. Here is a summary of our review of the service. We were also informed that the company assigns individuals writers to each order and that it allows customers to communicate with the writers during the course of the writing. We had no idea the disappointing experience that was waiting for us. When we approached the service, we expected them to live up to their promise of consistent value on all assignments. We started by analyzing some of the samples posted on the company website to get a feel of their level of writing. The papers were error-strewn and barely followed the required academic writing guidelines. In one of the samples, there was completely no connection between the topic on the title page and the rest of the paper. We went a step further to see whether there were some customers who had been satisfied by the service. Despite the atrocious claims of 100 percent customer satisfaction, we found tens of customers who had received duplicated content from the service. There are also some complaints with some customers saying that what they got was not worth what they paid for. We did not wish to take the numerous negative reviews at face value since some people can post negative comments maliciously. As such, we decided to test the service for ourselves. We placed an order for a five-page analytical essay due in three days. The outcome was depressing. The writer kept asking for deadline extensions and took forever to respond to our messages. The draft that we were promised never came. When the final paper was finally ready (two days after it was due), it was nothing like what we had ordered. The writing was poor and the research superficial. There were many instances where the writer blatantly went off-topic, straying into areas that were not significant to the task at hand. The citation and referencing was even worse than the content. The MLA format we had suggested was not used. Instead, the writer jumbled up anything he could conjure, using outdated sources and missing important entries. To summarize, it was appalling. A student would not be able to submit such a paper to a college instructor. Given what was delivered to us, and going by the many negative reviews, we find the company claims that it only hires native English-speaking writers with masters and Ph.D. degrees hard to believe. Customer service is one of the cornerstones of good service, the industry notwithstanding. On the company website, it is indicated that the service has a responsive 24/7 support team. Well, we had to see for ourselves. We did contact the customer department on three separate occasions with detailed and specific questions relating to policies and products. Although the agents were polite, they lacked a complete understanding of the company processes and guarantees. One of the support agents even told us that we could get a whole dissertation in three days —impossible. What we found worrying is the amount of time we had to wait before some of the questions were answered. In one occasion, we were made to wait for fifteen minutes amid chat. This is one of the worst support services we have encountered online. One of the most important attributes of any academic writing service is the competence of its writers. The level of the research, drafting, and editing depends on it. While we could not verify the qualifications of individual writers, we can pass some form of judgment based on the originality and thoroughness of the samples and of the paper we ordered. Given the inconsistencies, typos, and errors as well as the failure to follow instructions, we can only assume that the company has hired low-quality writers. The grammar is not something that one would expect from a native English speaker. Even their blog posts are strewn with typos and wrong word usage. While customers actually get their papers delivered, what they get is way below par in terms of the expectation. The situation is dire. A good service ensures that customers can quickly locate the information they need to place an order. Well, perhaps the company was going for a simplistic look but failed at it. The information is not organized, and it took an hour long to even find guarantees. The website is not appealing, although this could be a matter of preference. Pricing is a major factor in students’ decision to seek writing assistance. While good writing does not have to be exorbitant, students are advised to be wary of ridiculously low prices. The prices set out by the company are about average, although the ultimate product cannot justify the cost. It would have been better if the company had found ways of keeping the costs low without compromising on the products delivered. We also failed to get a price chart on the site, which would have articulated the pricing policy and the factors considered. There is also no discount offered to the customer, which makes the services comparatively costly. A good service allows users to pay for their papers using several alternatives. We were, therefore, surprised when we learned that there was only one payment option. This meant that we had to open an account with the provider before we could place an order. Imagine having to do that and wait for approvals when your paper is due in a few hours. There should have been more payment methods. A refund policy is meant to shield customers from non-delivery and duplicate content. We were, therefore, baffled upon learning that the company does not offer any refunds, even when the writer fails to deliver your paper. If the company were sure of its ability to provide top-notch copies on-time, it would have a money-back guarantee on any piece. Should Students Trust This Service? Unfortunately, this is not a writing service that we can recommend for students. While this is definitely a legit service, it has a long way to go before it can be one of the top academic writing services. The level of writing is not where it should be in 2018. The writers are neither native nor competent, despite the claims on its website. In addition, many customers have complained about the originality of papers provided here. If you need fast and safe writing assistance, then this is not the service for you. It would be best if students look elsewhere for their writing needs.